Excited to be sharing another Eid outfit with you guys! This was my first black abaya EVER. It came with a matching black scarf but I had swapped that for an extra punch of colour, wearing this shiny, almost-glittery scarf I bought just one day before Eid recently. Plus, electric blue happens to be one of my most favourite colours! I wore the same scarf but in brown on Eid itself, so, by the way I'm curious: which style of hijab do you like more, the one I did here with this blue or the fancier wrap thing I did on Eid? Let me know in the comment section down below guys! There are so many similar black bedazzled abayas out there—I myself own an almost identical abaya with purple stones—but the fact that this black-blue-silver one was gifted to me by Shah's sweet, sweet cousin whom I met when I stayed in Paris a few years ago made it really special to me. As much as I love a good comfy (and VERY forgiving!) dress like this black bedazzled abaya (or this year's Eid outfit or this sorbet caftan), I'm really starting to miss wearing the traditional baju kurung, so hopefully I can scavenge one from my closet room or the piles of clothes in the store room for when I "resume" celebrating Eid this weekend! I love this shade of Blue on you Liyana! Those backless mules are catching my eye too. 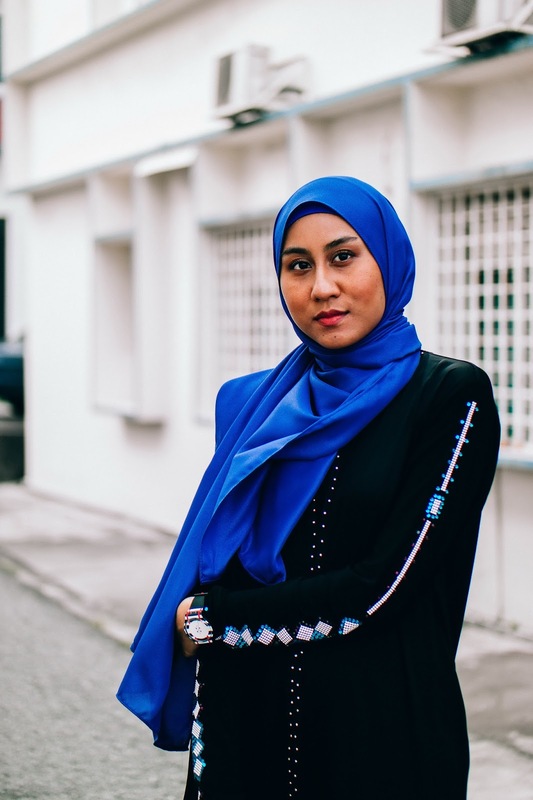 I love this embellished abaya and you look really lovely in cobalt blue Liyana. I don't think I have a preference for a particlar type of hijab. I think your comfort and your judgement about what feels best with a particular outfit is what is most important. Not having worn one myself i don't think it would be appropriate. BUT! I do have a question... Are the shorter style scarfs usually reserved for more casual clothing and the long styles for more formal occassions? I'm thinking that shorter might be cooler and more comfortable... You always do a great job of coordinating the items in a look but it's interesting to know more about the hijab in daily wear! I don't know if others might find you giving your two cents on hijab style inappropriate, but I LOVE getting your opinions on ANYTHING style, Judy! I think black abayas can feel a little bit, what's the word...rigid? For the lack of a better word! The fact that you like the mules with this abaya makes me think I definitely made the right decision to go with them instead of a more feminine (and proper) flats, because I was going back and forth with my choice of shoes before stepping out of the house!